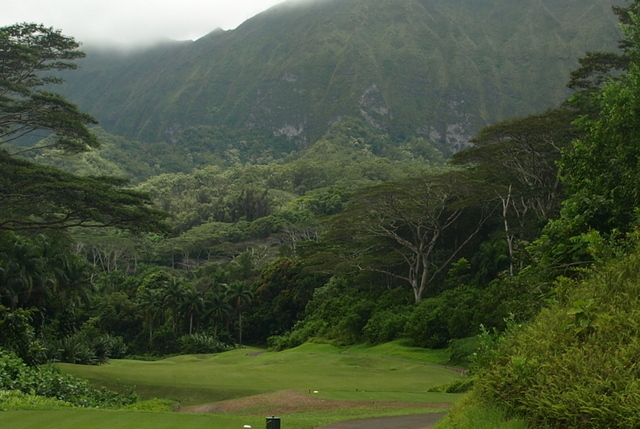 Nestled at the base of the Ko'olau Mountains in Oahu, Royal Hawaiian Golf Club enjoys a stunning tropical setting framed by ancient jungle trees that climb to more than 100 feet tall. 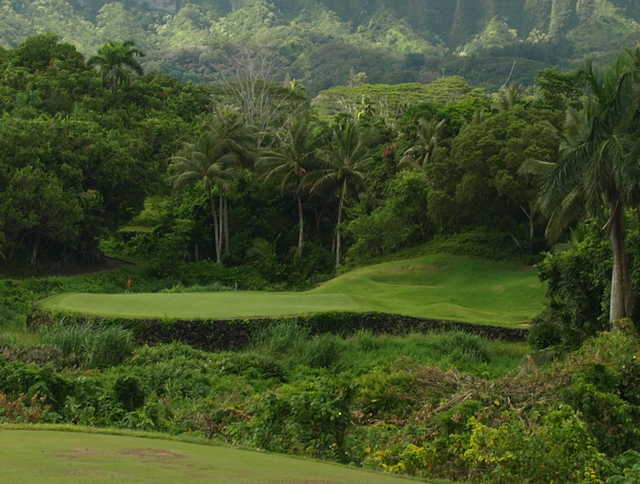 Nestled at the base of the Ko'olau Mountains in Oahu, Royal Hawaiian Golf Club enjoys a stunning tropical setting framed by ancient jungle trees that climb to more than 100 feet tall. The father-and-son team of Pete and Perry Dye designed the course. There are many telltale signs that this is a Dye course, from the many elevation changes to the varied bunker styles that are utilized throughout. 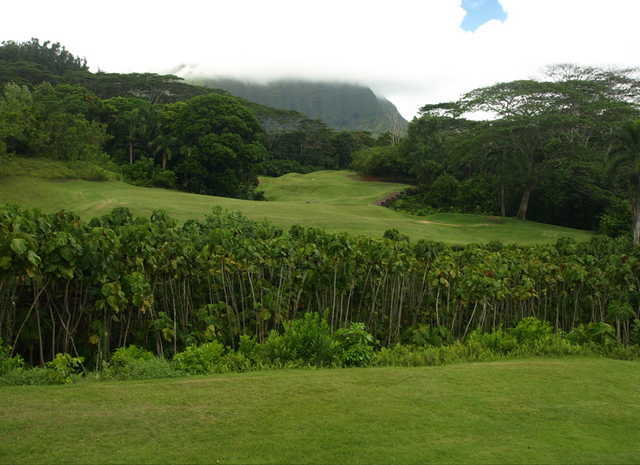 The round begins with stunning views as you plunge downhill into the Maunawili Valley. There are more trees and narrower fairways on the front nine, contrasting nicely with the wide-open back nine. Royal Hawaiian Golf Club's back plays towards the mouth of the valley, offering a view of the mountains and sparkling blue Pacific waters in the distance. 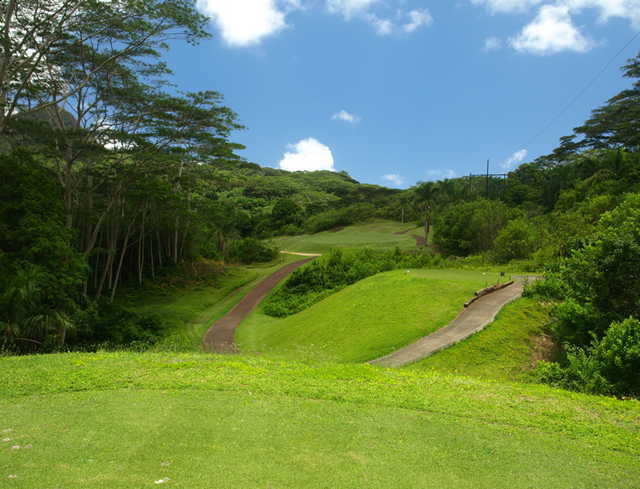 It's not an overly punishing golf course but locals and visitors alike have called it the toughest and most scenic course you'll find on Oahu. What a great place. Love staying and playing. You might recognize some scenery from a Jurassic Park movie. When you drive to the next tee box you can’t see a thing then you get there and it opens up. Aersome! Magnificent scenery, bring your A game and really fun to play. We had a fabulous time and would love to go back! Outstanding course and staff...a pleasure to play...a challenging course that you'll never forget. What a great course!! A must play, very Beautiful and in great shape!!! Staff is very good!!! Best in Hawaii by far, played 2days in a row it was so good!!! You will love the views and the golf is GREAT!!!!!! This is a Must play!!!!! Difficult course. Better know how to play golf. Would help if you had a fore caddie to tell you what is ahead of you. My wife and I started with a dozen balls and we had to buy another dozen for the back nine. Beautiful course with great views. This is what golf in Hawaii is all about. There are other courses on the island that are way more expensive but don't give you anywhere near the same experience. Eric from HiGolfGuide recommended this course to me, and even gave me free transportation from my hotel. 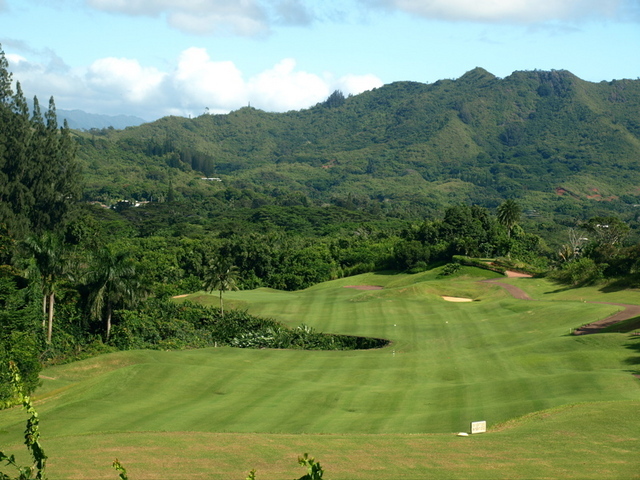 If you only have one course to play on Oahu, do yourself a favor and play here. You will not be disappointed. 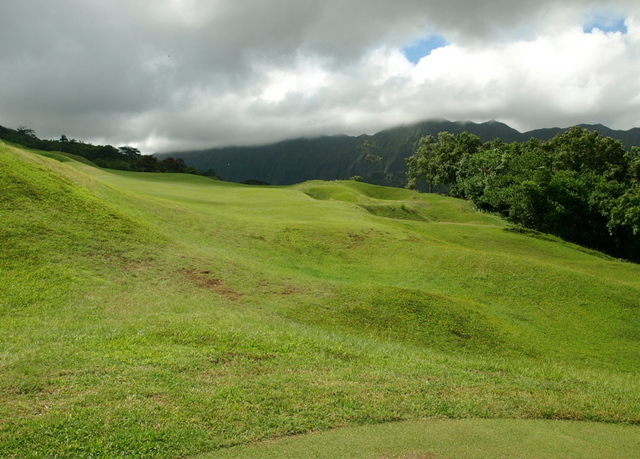 If you're in Oahu, you have to play this course. It's been a couple years but not only is this a gorgeous golf course..it's one of the most beautiful spots I've ever visited. My father-in-law and I had a blast playing this course and, if I remember correctly, we didn't score all that badly either. Played five courses in Oahu and Maui and this one I'll never forget. This is a super golf course in great condition. 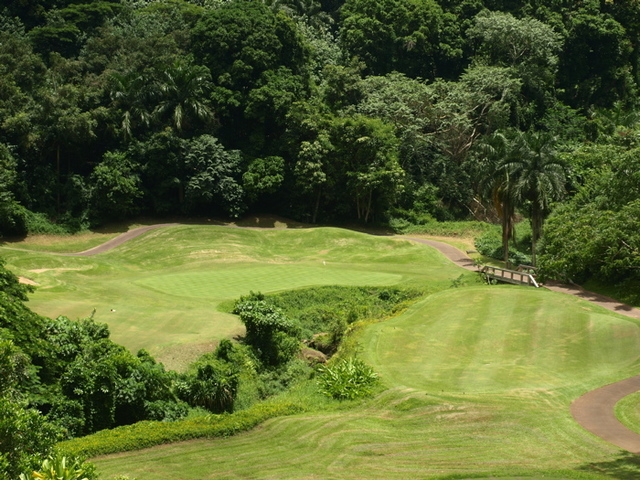 Although it is a bit short, each hole requires a precise shot to score. The back nine is beautiful and you can get involved in watching the scenery rather than thinking about your shots. I will play this course again. What an amazing course.Over on holiday and highly recommend playing this great layout. Excellent service by pro shop staff,very efficient.This course would suit golfers on low to high handicaps.Course was in excellent condition.Front nine challenging but also very forgiving if hitting a wayward drive.Back nine is like you are in another world,just like Jurassic park scenery.Back nine is a lot tougher and you have to be fairly accurate with tee shots,best to use 3 wood or rescue club from the tee on most holes.Unless you want to risk it and let it rip which is quite rewarding if it works.Overall I would rate this course 5 stars and recommend it to any golfer. This golf course is a treat, and each time I play it I wonder why I don't play it more often. 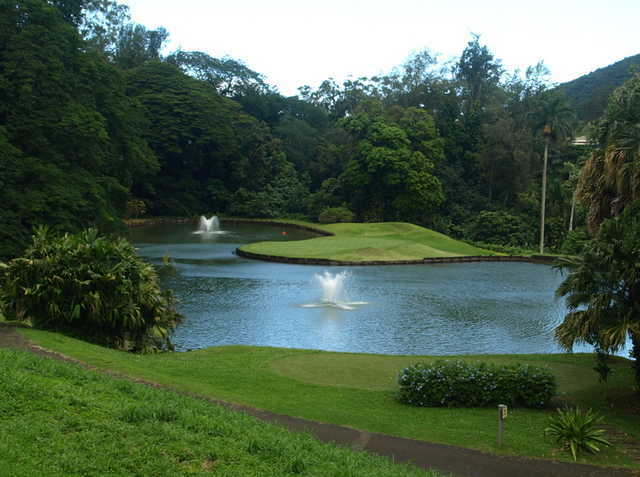 The scenery is jungly and you're taken away from any type of urban thoughts as you make your way around 18 holes of distracting greenery. The grass on a few greens was clumpy and dying, and the range and 10th hole were closed for renovation last time I played which is why it's only getting 4 stars. 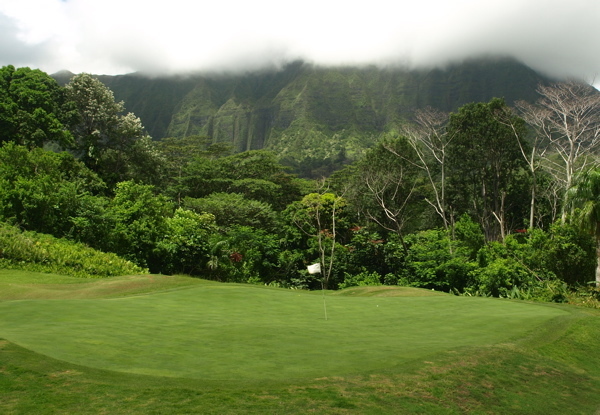 It is our favorite course on the Hawaiian Islands and We play it many times every trip. It is worth the lost balls and is unsurpassed in natural mountain beauty. We hope the new owners will renovate all the buildings. One of the best courses I have played...better than the "Teeth of the Dog" in the Dominican, which Pete Dye has said is his favorite course! The course gas undergone some major changes since March of this year when Hawaiian Golf Properties took them over. 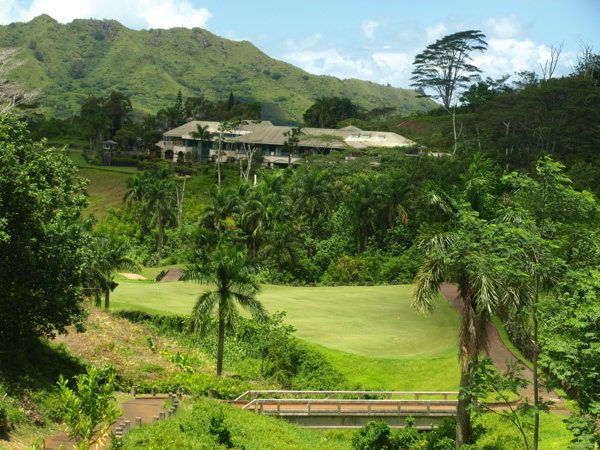 They've got a PB Dye/Pete Dye monster deep inside the Maunawili Valley. They have taken the weed whackers out and cut back a lot of what used to be the bush lines. They're trying as much as possible to make the course more user-friendly. They're widening up the fairways and cutting down trees in the right spots. 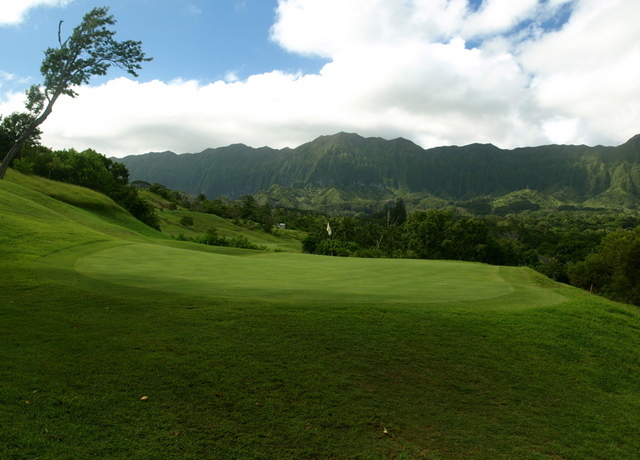 The greens are the last bent grass greens on Oahu. 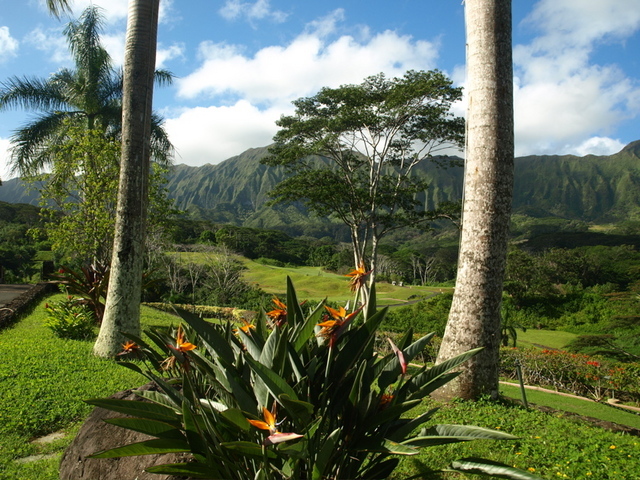 The cool moist Kailua climate allows for the grass to flourish there. But the slopes and undulations are wicked. The Dye boys are notorious for intricate greens, and these are amongst the most undulated anywhere. Everyone always complains about losing balls. Hit it straight then!! You don't need to pull driver on every hole. Just keep it in play and you can score here. I love this place and play as often as I can. While it's short, it is target golf throughout! When my game goes astray, this place brings it back in line. The customer service is top notch, I have never seen it backed up and the course is beautiful! One of my favorites on Oahu! Don't forget to ask for the military rate if you serve! Like an aging Hollywood movie star,Luana Hills has seen better days. Her exterior is shabby and faded but head out onto the links and her beauty and charm will ensnare you instantly. 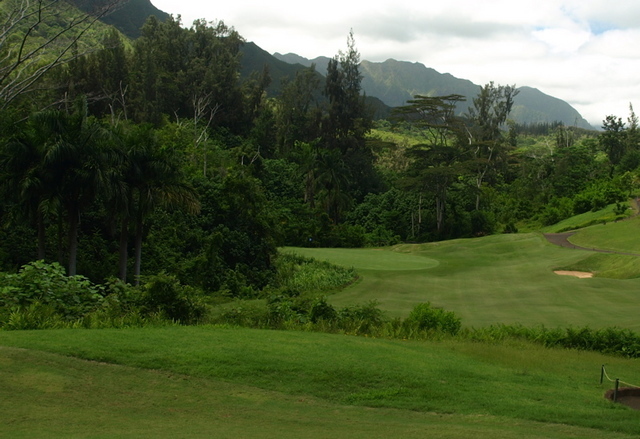 Each hole is interesting in it's own right, offering all sorts of challanges (including a 401 yard Par 5, which is demonic in its simplicity) Not as difficult as its neighbor Ko'olau, Luana Hills is it's own beast, a typical Pete Dye course...always out to get you. Give it a try, I thimk you'll likr it once you put the shabby facade behind you.